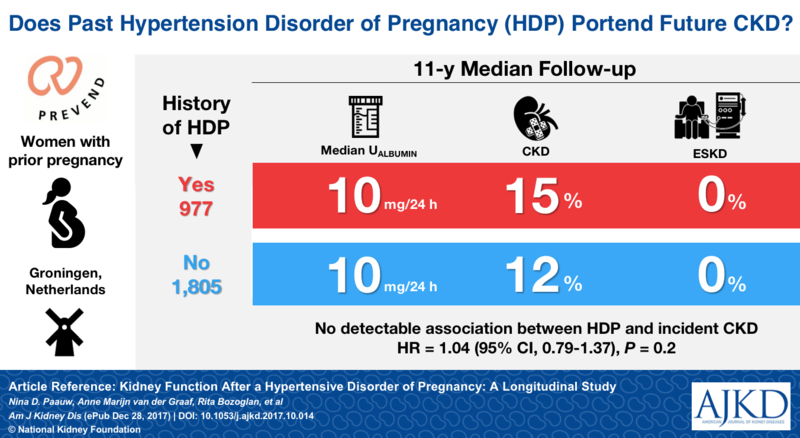 From the authors: Registry-based studies report an increased risk of ESKD after hypertensive disorders of pregnancy (HDP). In this study, we investigated whether there is an increased incidence of CKD and/or worsening of kidney function after HDP. For our analysis, we used women without and with patient-reported HDP (nonHDP, n=1805; HDP, n=977) who participated in the PREVEND study. Study participants had a mean age of 50 years at baseline and median follow-up of 11 years. Our results showed that women with a history of HDP did not have a higher incidence of CKD compared to nonHDP. In addition, we observed only marginally lower levels of kidney function after HDP and no differences in urinary protein loss during follow-up. In conclusion, in our setting, we could not confirm an association between HDP and reductions in kidney function. 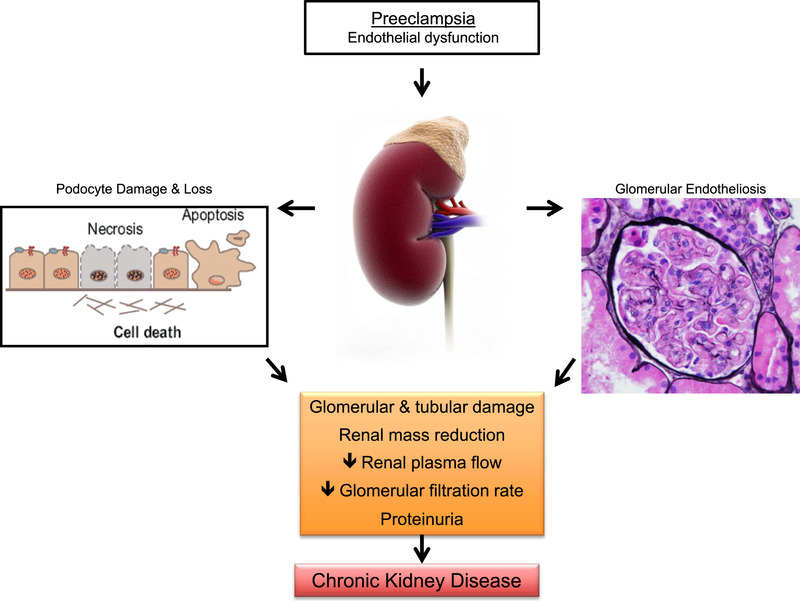 Possible mechanisms connecting preeclampsia to CKD. Figure 1 from Kattah and Garovic, AJKD © National Kidney Foundation. From the authors: Although dialysis may provide little survival benefit for older patients with kidney failure, few are informed about conservative management (CM). This qualitative study examined how nephrologists decide whether to present CM and variation in their approaches. Semi-structured interviews of a national sample of 35 nephrologists revealed that few (37%) routinely discussed CM in care discussions with older patients. 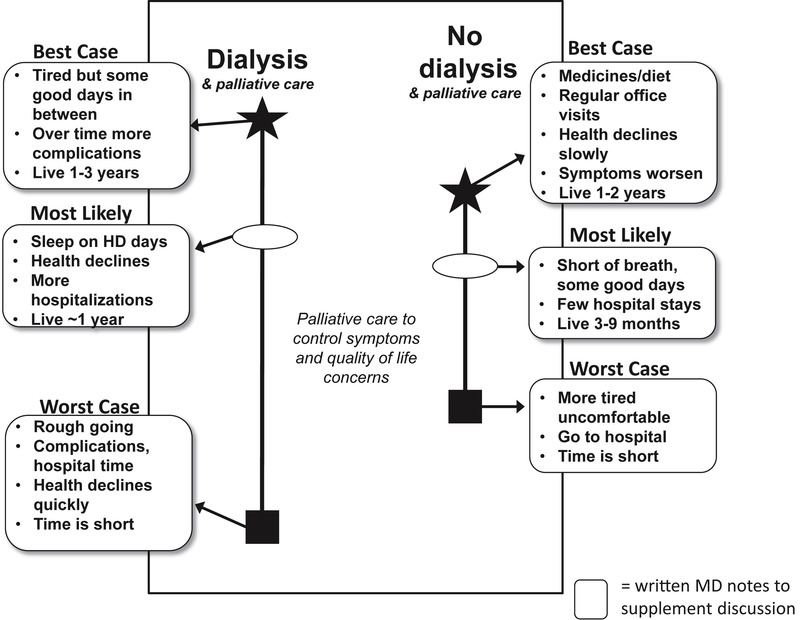 Nephrologists’ approach to CM discussions was shaped by perceptions of their role and by a common view of CM as “no care.” Their willingness to pursue CM was influenced by provider-level and institutional-level barriers and experience with older patients who regretted or had been harmed by dialysis (moral distress). Nephrologists who routinely discussed CM found that this relieved moral distress. Our findings clarify how moral distress serves as a catalyst for CM discussions and highlight points of intervention and mechanisms potentially underlying low CM use in the United States. Figure 1 from Grubbs, AJKD © National Kidney Foundation. From the authors: The advantages of kidney transplantation from living donors include complete avoidance of dialysis (preemptive transplantation) or a shorter duration of dialysis compared to deceased donor transplantation. Complete avoidance of dialysis is associated with a lower risk of transplant failure; however, whether shorter dialysis exposure in non-preemptive transplantation is also associated with a lower risk of transplant failure is uncertain. Among living donor transplant recipients who had been treated with dialysis in the United States between 2000-2016, dialysis treatments for greater than six months were associated with an increased risk of transplant failure, and this risk was higher in patients with progressively longer exposures to dialysis treatments. Dialysis exposure was longer in lower income and Black patients, and varied markedly between transplant centers. This study highlights the potential value of timely referral of kidney failure patients receiving chronic dialysis treatments for transplantation. 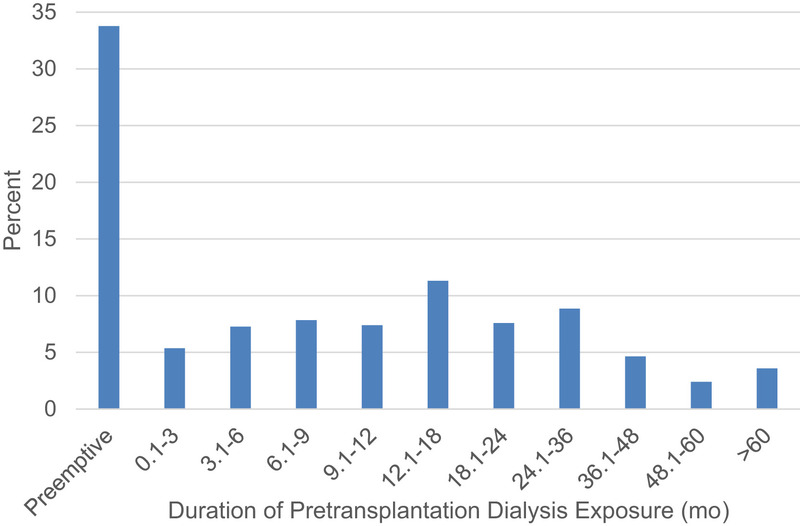 Total duration of pretransplantation dialysis exposure among n = 77,607 first living donor kidney-only transplant recipients. Figure 1 from Gill et al, AJKD © National Kidney Foundation. From the authors: In this study, we examined how weight changes over time among children with CKD. We found that on average, weight loss begins to occur during more advanced stages of CKD, and that this weight loss is correlated with a higher likelihood of needing dialysis or kidney transplant. More attention to weight and nutritional status, especially during the advanced stages of kidney disease, may help improve outcomes among children with CKD. From the authors: The goal of this study was to understand when weight loss occurs as CKD progresses, and whether weight changes that occur during the later stages of CKD would increase the risk of death after starting dialysis. We found that weight loss begins to occur at moderate levels of renal dysfunction, and this weight loss was associated with a higher risk of death after dialysis initiation among adults with CKD. From the authors: Previous studies in ADPKD reported that once kidney function starts to decline, progression to a level requiring dialysis or transplantation is relentless and rapid. We examined actual measurements of kidney function that were obtained regularly for 5-8 years among 929 participants in the HALT-PKD trials. We used unbiased statistical methods to describe patterns of kidney function decline and classify them as stable or progressive in a linear or nonlinear pattern. While many patients experienced a linear progressive decline in kidney function, a substantial minority had nonlinear patterns, with periods of stable function for several years even after prior periods of steep decline. Deviations from linear progressive patterns were likely due to the combination of multiple genetic and environmental factors. 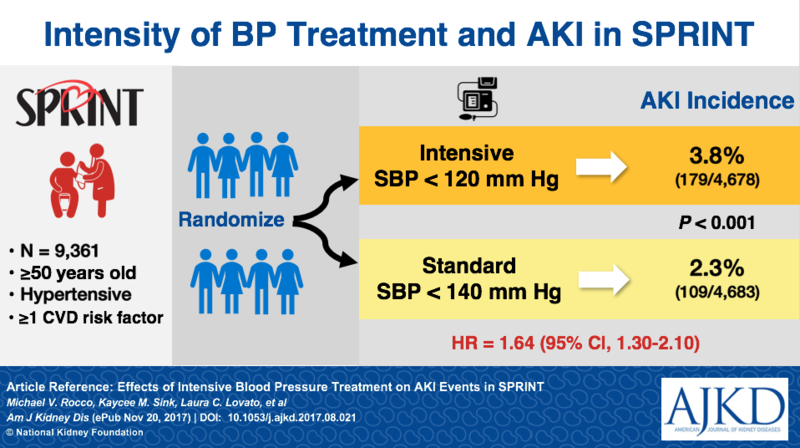 These spontaneous changes in kidney function will likely necessitate larger and longer clinical trials of new drugs for ADPKD so that the comparative benefits of therapies can be detected. From the authors: An arteriovenous fistula (AVF) is a surgically-created blood vessel enlargement, used to send blood through dialysis machines rapidly enough for chronic hemodialysis treatment. We identified care processes predictive of three AVF creation surgery outcomes: i) attempted use; ii) successful use for chronic dialysis (“overall maturation”); and iii) unassisted successful use, without further postoperative procedure(s) (“unassisted maturation”). Attempted use was less likely with more intensive postoperative follow-up (earlier and more frequent surgical follow-up, or routine postoperative ultrasound) and among patients undergoing procedures to improve AVF function. Unassisted maturation was more likely in facilities with vascular access coordinators, but less likely when unsuccessful attempts preceded the first successful dialysis session. Overall maturation was less likely after bleeding at venipuncture sites. Unassisted and overall maturation were less likely with longer intervals from surgery to first attempted use, and first attempt to first successful dialysis session. Thus, modifiable care processes may improve AVF maturation. On the Cover: Children’s art – such as this second grader’s depiction of a whale’s spout in a windswept ocean – captivates us through its simplicity and often encourages us to reminisce about times free from worries and responsibilities. However, for kids coping with kidney disease or other chronic illnesses, childhood can be anything but carefree, especially when it comes to concerns about how disease impacts their function and self-image. In this month’s issue, Elaine Ku and colleagues report an association between weight loss and more rapid progression to ESRD in the CKD in Children (CKiD) cohort. The study suggests greater attention to weight status and nutrition in children is merited, since intensified weight loss may identify those patients who are higher risk for developing ESRD. “Ocean Storm” © 2016 Lucia E. Frank. Reproduced with permission.